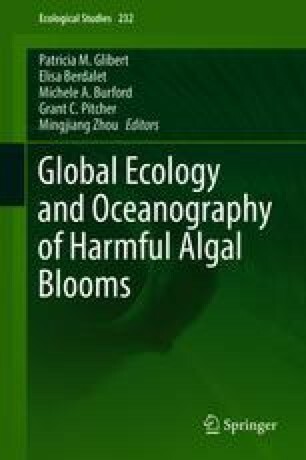 The Core Research Project (CRP) HABs in Upwelling Systems was developed as part of the implementation of the international science programme the Global Ecology and Oceanography of Harmful Algal Blooms (GEOHAB). Progress in addressing eight key questions identified as a requirement for advancing our understanding of the ecology and oceanography of HABs in upwelling systems is reviewed. The considerable diversity of HAB species found in upwelling systems is considered to reflect the mosaic of multiple and shifting sub-habitats present within upwelling systems. In developing predictive capabilities, the need to consider species-specific behaviour with reference to the environmental and ecological parameters that characterize these sub-habitats is demonstrated. However, the limited spatial resolution of many numerical models has prevented incorporation of the complexity created at the small scale by physically driven niche diversification. Observations of opportunistic exploitation of multiple seeding options rather than depending on a single seeding mode further complicate prediction. Although contrasting nutrient strategies have been demonstrated for HABs in upwelling systems, attempts to determine species-specific nutrient requirements are few. The timing of HABs is controlled by wind stress fluctuations and buoyancy inputs at the seasonal, event and interannual scales, whereas the spatial distribution of HABs is controlled by mesoscale features that interrupt typical upwelling circulation patterns leading to the identification of HAB hotspots. Here cross-shelf and alongshore currents are important in the transport, accumulation and dispersion of HAB populations. With increasing availability of long-term data sets, changing trends in HABs related to climate are emerging. Owing to the strong physical control of HABs in upwelling systems, successful prediction as a possible outcome of the integration of real-time data into model systems as a component of operational forecasting of the ocean is most likely to be achieved, thus taking a critical step towards fulfilment of GEOHAB goals. This is a contribution of the GEOHAB Core Research Project on HABs in Upwelling Systems.